La Fontane can comfortably accommodate six people and is spacious for two, so you can relax with the family or couples can go walking in the midst of nature. It's very spacious (125M2) with a large family room with kitchen, dining, and sitting areas either around the stove or in front of the picture windows with their incomparable mountain views, dominated by the Pic of Montcalm (3000m) opposite. The kitchen area is well equipped including with a dishwasher, and there is a utility room with washing machine and tumble dryer. Above the family room there's a mezzanine where your can watch multi-channel TV or play pool. There's a stylish shower room, and three comfortable bedrooms with double bed, twin beds and twin bunks. In the middle of the Parc Naturel Régional it faces due south, like the sunny village of Orus above. You can enjoy the view either from the terrace in front or through the picture windows of the large living room. In the evening you can listen to music on the hi-fi in front of the fireplace, play pool, read, surf the wifi, or watch TV. The children will love exploring the extensive wooded grounds and walk up the track to the village of Orus (5 minutes), where you can play table tennis or table football in the old village school or walk down the track to Vicdessos and its market on Thursdays. In Vicdessos, we have a well stocked Spar supermarket, a butcher, a good boulangerie, a pizzeria, bar-restaurant, pharmacy, post office with cash point. The valley is famous as a centre of mountain recreation and sports activities. These include walking - there are two beautiful marked footpaths which can be accessed directly from the house. These connect to the many well-marked trails in the valley including the GR 10 path that crosses the Pyrenees, connecting the Mediterranean to the Atlantic. In summer (July-August) there is an outdoor swimming pool in Auzat (10 minutes) surrounded by mountains. Ax les Thermes (40 minutes) offers a relaxing natural hot spa experience throughout the year. We have climbing, including in Vicdessos a practice climbing wall. (5 minutes by car) We also have "via ferrata" (safe but spectacular climbing with fixed steel loops to attach to) and an "accrobranche" (adventure park with zip slides). There is trout fishing, caving, canoeing and canyoning (river rafting, abseiling and sliding down waterfalls). All of these activities can be supervised by highly qualified guides who ensure your safety at all times. For those interested in history and archeology not to be missed in the valley, the magnificent 14,000-year-old drawings of the Niaux cave, one of the few cave art sites still open to the public. This can be complemented by a visit to the Parc Pyrénéen de l'art préhistorique where the interior of the cave has been faithfully reproduced and where you and the children can learn about the life of our ancestors, for example how to throw spears and make fire the way our ancestors did. We also have a fascinating local history. In the XIII century the region was a centre of the Cathar religion and we are not far (45 minutes) from the breathtaking castle of Montségur where the Cathars took their last stand against the forces of the King of France and the Pope. Within living memory, the region was a centre of resistance to the Nazi occupation. Many Allied aviators and other refugees were smuggled across the border across the mountains from here. The ancient Orus water mill was operated secretly during the night to grind corn to prevent seizures of food by the occupation troops. We can also walk (or drive to) the village of Sem directly across the valley from La Fontane where iron was mined between Roman times until the 1930s. We can also follow the aluminum trail that commemorates a hundred yearsof the industry until 2003 at Auzat and whose main legacy are the giant reservoirs now used to generate hydro-electricity. We have cultural events as well as the popular blues festival in Vicdessos, which attracts hundreds to participate in class acts. The tourist offices of Auzat and Vicdessos offer up-to-date information about events in the area. Each village holds its fete in July or August to which visitors are welcome. Or…relax on the terrasse beneath the shade sale and watch the wonderful butterflies, birds and lizards. We are teachers who come her with our children as often as possible, far from London's noise and pollution. We feel ourselves relaxing the moment we arrive. We would like you to share this feeling of pleasure. This stay will give you the feeling of peace and relaxation, but will also provide you with unforgettable activities and and experiences as shown by many of our guest reviews. The house is situated in the middle of a sensational mountain view offering peace, activities and pure mountain air. Its facilities make it spacious and comfortable. Terrific accoustics for listening to music, including your own! Selection of toys for children up to the age of 9. Double swing and goldfish tank in the garden..
Rock garden with flowers and shrubs, roses, wisteria. Great for children. Full south facing patio with shade sail. Large French windows overlooking the valley and Montcalm. - large living space, great toys, good books and local maps and info, cool hi-fi circa 1989! - Vicdessos is a great base - we never left the valley. The great outdoors is all there and waiting! We loved how quiet and unassuming it was here compared with the inescapable bling in the Alps. We had a very happy week. Thank you for a great holiday! A wonderfully appointed and peaceful home, well equipped with excellent support from the owner and from the delightful local caretakers. We could not have found a more perfect place to relax and bask in the beauty of the surroundings, and to explore this lovely corner of France. This is a fantastic property - book it now! The property lives up to the photos - the views are to die for and the property is spacious , secluded and very well appointed. The furnishings are comfortable and have a homely feel which makes you feel relaxed in enjoying and making the most of the space provided. The kitchen is very well equipped and plenty of consumables were provided along with linen and towels etc. (all spotless). The property is just below the village of Orus (it is up its own gravel drive a few switchbacks below Orus) and as such is not overlooked by any other properties (unless you count those several km away on the other side of the Vicdessos valley!). During the day the property stays cool (you can close all the shutters and the main living room ceiling is high). Great selection of books and games for the children. It does take a few minutes to drive up the steep hillside but if you want to be away from it all this is a fantastic holiday property. The owner and local contacts are friendly and professional - this really is a superlative property. There is loads to do in the area too - make sure you book in advance for the Grotte de Niaux (14,000 cave paintings!). I hope we can return one day. My wife and I stayed here for a week in May 2017. La Fontane, the house, is beautiful, well furnished, and extraordinarily well equipped, down to an extensive and interesting selection of books, music and videos and a collection of toys for younger people. If you need a kitchen tool a bit of rummaging around will usually produce it. The guest book is unique in that it includes a lot of tips about things to do (or avoid) passed on from previous guests. It is super quiet, except for bird songs and the occasional church bell. It's a good base for hiking and other explorations of whatever interests you. We made easy day trips as far as Mas d'Azil and Puivert, usually including lunch. The road up to the house is narrow and includes 12 switchbacks and 3 blind corners, but it is rare to meet another car. Cecile and Eric live in Orus, just above, and respond quickly to questions or problems. The situation of this property is fantastic, with views across the mountains at this high altitude is a paradise. The property is clean and has many facilities to help you relax during your stay. Communication was good between the owner, Peter and our connection at the property, Cecilia and Eric. I would highly recommend this property and hope to return again. Thank you for your kind review. You are of course welcome to return at any time. Our stay at La Fontane was perfectly amazing and amazingly perfect. The house itself was spacious and very well equipped. The view from the patio is stunningly beautiful and we spent many happy hours watching the changing light and shadows over the mountains. We felt we were in a different world of beauty, peace and solitude and the stresses of everyday life seemed a million miles away. The village in the valley was handy and convenient for all our daily needs and we were impressed with the friendliness and helpfulness of the locals. La Fontane is well placed for visiting places of interest nearby. We visited Foix, Mirepoix, Andorra, Carcassonne, as well as enjoying road trips through spectacular mountain passes. We just can't wait to be able to go to La Fontane again! 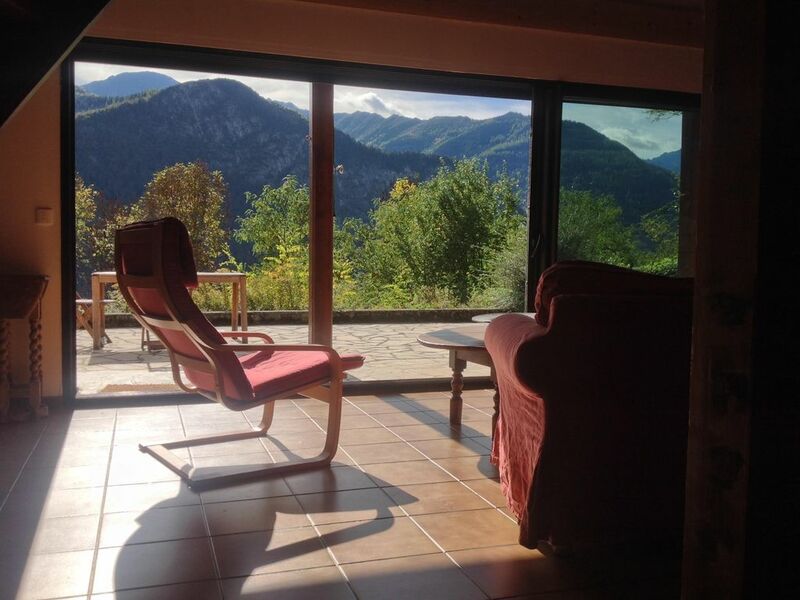 La Fontane a secluded 125m2 house in the Haute Ariege Regional Natural Park in the Pyrenees is named after the stream that flows through its large grounds. Awarded a 3 star rating by the préfecture départementale, the house faces full south just below the pretty, cobbled and sunny village of Orus. Its large French windows offer magnificent views of the Vicdessos Valley and of the 3000m Montcalm.peak and open onto a patio and a beautiful rock garden. It boasts a big living room with a sitting area in front of a glass-fronted wood burning stove, a dining area and a large well equipped kitchen area . As a family home it has all amenities, including microwave, dishwasher, fridge, freezer, washing machine and tumble dryer. There's a mezzanine with a large LCD multi-channel TV, DVD player and pool table. It has 3 bedrooms, bathroom with shower, 2 toilets, Baby equipment includes a cot and a high chair. There are goldfish in the terrasse pond. There is a good restaurant nearby and food shops in Vicdessos (5 mins) and in Tarascon-sur-Ariege (20 mins). The amazing cave paintings in Niaux are 11km away. La Fontane is Ideal for nature lovers, hikers, walkers and for all varieties of outdoor activities, or by contrast for those who just like to relax on the terrace with a good book and a drink. Enfants de moins de 2 ans gratuit. Linge de lit (1 drap+1 housse de couette+oreillers), serviettes et ménage a la fin du séjour inclus dans l'offre. Les premiers 125kwh d'électricité par semaine louée offerte . Consommation d'électricité au dessus de 125kwh par semaine louée sera facturée 0.15€ par kwh.ainsi que le bois de chauffage (offert). Bed linen and towels and end of stay cleaning are included in the price. The first 125kwh of electricity per week rented is free as is wood fuel for the stove. Electricity consumption over 125kwh per week rented is chargeable at 0.15€ per kwh. This will deducted from the damage deposit after the end of your stay.